In 1985, the Tadrart Acacus mountains were included in the UNESCO list of World Heritage Sites precisely in reference to its rock art, as an example of “a unique or at least exceptional testimony to a cultural tradition or to a civilization which is living or which has disappeared” (Criterion III: http:// whc.unesco.org/en/criteria/). Since the beginnings of the research activities, rock art has represented one of the main research topics of the mission. Thousands of engravings and paintings, made in the last ten millennia and decorating rock walls and shelters in the Acacus and Messak massifs, have been recorded, reproduced and studied in their stylistics and chronological aspects, in a site-oriented approach, even if with a growing attention to conservation issues. Recently, the Mission radically changed its aims and organisation in favor of a landscape approach, in order to isolate and define the relationships between physical environment, archaeological contexts and rock art features, to better investigate the environmental, socio-cultural and ideological dynamics of the past cultures. From 2001 onward annual campaigns of systematic surveys have led to the discovery and contextualisation of hundreds of sites. Special emphasis was laid on the state of preservation and accessibility, and several efforts were directed at proposing active heritage conservation measures. di Lernia, S. and D. Zampetti (Eds.) 2008. La Memoria dell'arte: le pitture rupestri dell'Acacus tra passato e futuro. All'Insegna del Giglio, Firenze. di Lernia, S., and M. Gallinaro. 2010. The date and context of Neolithic rock art in the Sahara: engravings and ceremonial monuments from Messak Settafet (south-west Libya). Antiquity 84 (326): 954-975. —. 2011. Working in a UNESCO WH site. Problems and practices on the rock art of the Tadrart Acacus (SW Libya, central Sahara). Journal of African Archaeology 9: 159-175.
di Lernia, S., M. Gallinaro, and A. Zerboni. 2010. Unesco Word Heritage Site vandalized. 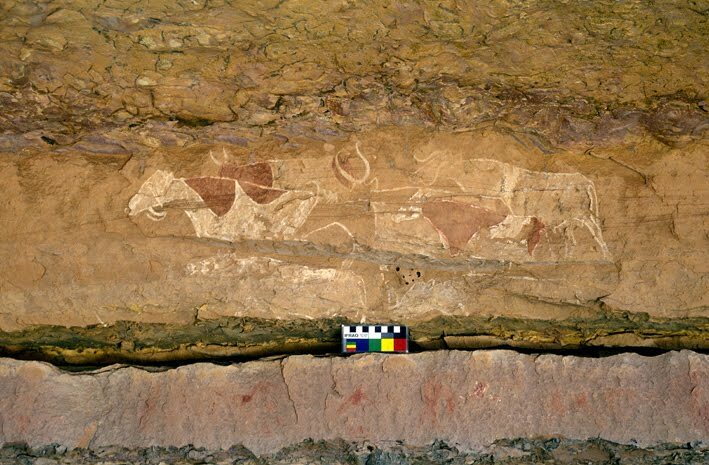 Report on damages to Acacus rock art paintings (SW Libya). Sahara 21: 59-76.